When it comes to how to do social media marketing, success doesn’t happen by accident. It’s all planned. But without some guidelines in place, it’s difficult to know what you’re working towards. Which is where a social media checklist comes in. Rather than throwing every strategy at the wall hoping one will stick, you act with intention. This helps guide the direction of your online presence and everything you post. 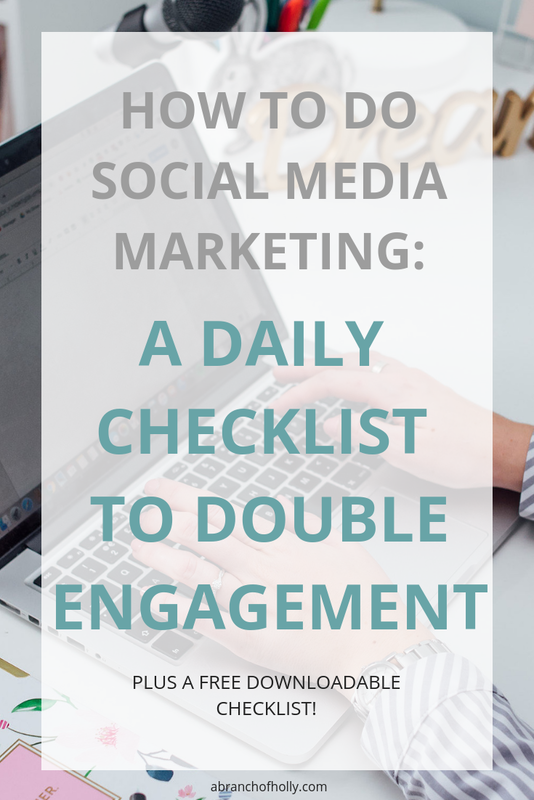 If you’re ready to learn how to do social media marketing and better manage your daily social media to-do list, this checklist is what you need. Read on to learn how to use it and don’t forget to grab your free copy below - keep it somewhere safe! Before we get to promotion, we first need to think about your content. It won’t come as news to you that creating valuable content is key to building trust with your audience. Show potential readers that you are the “go-to” resource. Build trust which translates into trust for your brand as a whole. If you sell products or services it also makes you a top choice when people decide to invest in you or your competition. Attract visitors to your site and achieve more conversions. If new visitors like your content, they will subscribe and share it with others. Both are key to growing a loyal following and successful online presence. But you can’t just share any old content. Any old content doesn’t get great results. You need to share the type of content that converts. The type of content you have already created that could be repurposed into new media. The type of content your audience is already engaging with. Look at your most popular content in Google Analytics and determine how you can update those posts. And the type of content that you want to be known for. Choose 2-3 topics that align with your brand and message. Don’t make it difficult for your audience. You need to make your content easy to access. This will not only help you build your brand, but it allows consumers to connect with you too. Now let’s take a look at how you can start to put together a great social media marketing strategy. Go to BuzzSumo and search for relevant keywords. Do the same in Pinterest. Look through your favourite blogger’s articles on Bloglovin’. Follow your favourite bloggers on Twitter and curate their articles from there. Your audience makes decisions in an instant. Will they stop and read or move on? Will they create conversation and engage with your brand or your competition? The average lifespan of a tweet is less than 18 minutes so given that, grabbing attention fast is important. Without attention, opportunities can be lost forever. That’s where visual marketing comes in. You don’t have to be an expert to know that visual marketing is highly effective. Visuals capture audience attention, increase engagement, and boost traffic. So how do you start? Attention-grabbing, artistic photography - Think styled stock photos. Screenshots - Useful if used right, e.g. taking shots of helpful images to go alongside your content. Infographics - Come in handy when you want to convey a meaty or super long message in an easy, bite-sized and informative manner. Comics - Make a long story short, captivating and humorous with relevant cartoons. Data visualisation - Present facts, figures and statistics in a simple and visually stimulating manner through standalone graphs and charts. Memes - Use trendy memes tailored to fit the context of your updates or posts. Miscellaneous graphics - Think of diverse images that complement your content. Visual note taking - Think of casually designed layouts of ideas. Try and incorporate each one across Facebook, Twitter, Instagram, and more in unique and channel specific ways. Video is on fire right now. Creating several videos (produced and live) that support your social media strategy is a must. Take key points from evergreen content and break them down into a simple bulleted list. Show your audience how to do something or make something better - fix their problem. Your video scripts don’t need to be long and complicated! People read content they like and invest in products/services they like. But they also buy from the brands they love. That’s something you can’t ignore. People invest in and buy from brands that represent their own values and beliefs. Of course, what you’re creating is really important. But how you market your content and build a community is just as important. A great example of this is Ryan Foland. He’s a communication strategist who knows how to engage his audience. He infuses his personality into his content in lots of ways, but I especially love his stick figure drawings. They tell a story, share insight, and include his audience in the conversation. Think about your brand as a whole and what you can do to build community around it. Now you’ve had a think about what you’re going to post, it’s time to figure out the steps you’ll take to increase engagement, traffic and sales. This is your daily social media checklist. It’s an easy to follow list of steps to take each day. Your daily social media tasks should take you no more than 30 minutes. I recommend you do them at the beginning and end of your day. I get that you think you might not have that kind of time. If so, you need to check out time blocking. These tasks are critical to help build your social media presence. So now it’s your turn. Read through the version here and then download and save the complete checklist at the bottom of the post. Reply to all comments (remember the three g’s: be grateful, generous and giving). Thank anyone that’s shared your content (keep track of this). Like and comment on 3-5 relevant Page updates (leave a thoughtful reply of five words or more). Share relevant content to niche-specific groups (don’t be spammy or too self-promotional, instead be helpful and valuable). Monitor mentions via keywords and respond to any questions, needs or concerns. Choose 3-5 influencers to interact with. Be genuine with your replies and interactions - people will notice! Make 10 new high value connections (use Twitter’s Advanced Search for this). Schedule 3+ posts to share throughout the day. Thank people for retweeting your content. Check incoming messages and respond to any necessary. Approve all invitations to connect that are a benefit and make sense to you and your brand. Share a relevant industry article or your latest blog post to your profile. Interact within 2-3 groups and see if you can offer any answers. Post 1-2 times per day - a mix of blog posts, roundup tips, top tips, funny/inspirational and relatable posts. Like one post from everyone that’s liked your content. Pin 20-30 images per day, a mix of your content and other people’s. Like 5 posts per day. Repin 5 images per day. Choose evergreen posts to pin to specific brand blog board. Update boards or titles that need to be optimised. Create a new video from existing blog content. Clean up your descriptions, add keywords, your URL, and tags to older videos. A lot of people think social media can be time consuming, but it doesn’t have to be. The best way to get started now is to find 2-3 of the to-do’s listed above that will have the biggest impact on your brand. Put them on your calendar and commit to them daily. Once you’ve got those tasks down, add to them. You’ll build momentum as you go. Make it fun, pay attention to your data and watch your engagement increase on every platform.